NEW from USG, the Kimberly Breeches. 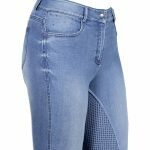 These “lived in”, medium wash denim breeches feature sassy splashes of crystals around the front and back pockets, Pink accent stitching, and a silicone full seat to ensure a firm grip in the saddle. Also featuring elastic V-shaped Lycra® leg bottoms.